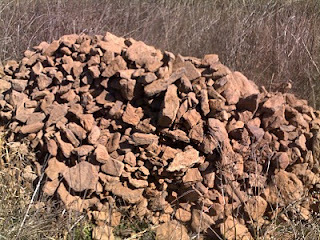 I've spent about four hours over the past two mornings picking sandstone rocks out of one of our fields. For years we only planted corn or sorghum there, and the rocks weren't an issue since the harvester cut the stalks several inches off the ground. Now that we're planting cool-season forages in this field, we either have to get rid of the rocks or be prepared to constantly bend/break/dull the blades on our cutter-condition (which cuts only 1-2" from the ground). We did a good job of removing most of the rocks from the real trouble spots about three years ago and have had minimal trouble ever since then. The main reason for that, though, was that we have been no-till planing the rye/oats and minimal-till planting the corn/sorghum since then. We needed to break the ground before planting this time, though, and the disking process unearthed lots of buried rocks. Even though there are rocks throughout the 40 acre field, we can get the worst places cleaned out after another hour or two of picking. By then we out to have enough rocks to fill in a hole, serve as the foundational base for a small "heavy use" area, or build a decorative driveway entrance leading to our milking barn. Hey Will, I had someone asking the other day what led to creation of rocks in different fields. What do you think happens in this case? Where do the rocks come from? Anything that disturbs the soil (plowing, erosion, frost heave, etc.) will tend to make rocks rise to the surface. 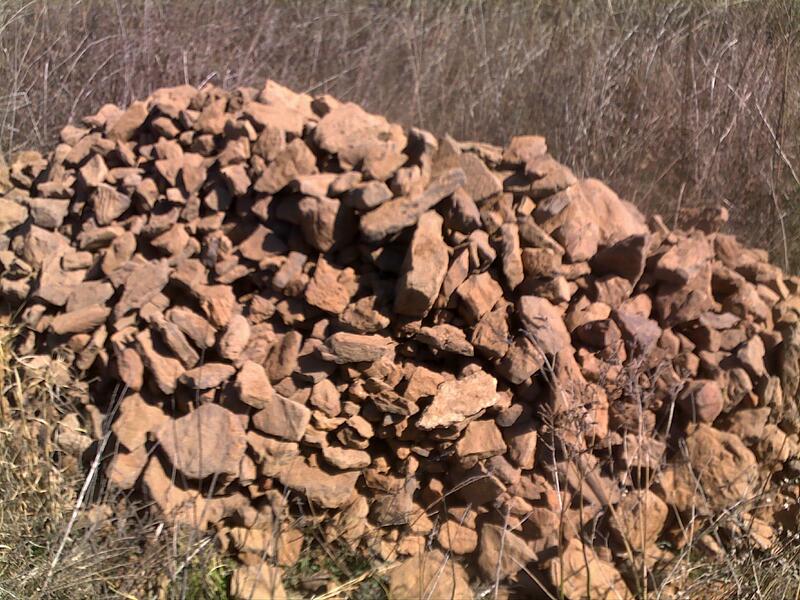 Farmers in the Catskills used to complain that there were "two rocks for every dirt." Rock picking - dislike. Thankfully we don't have to do it that often. Hope you didn't end up with a sore back! @RR - I'd much rather pick up rocks now than constantly be changing cutter blades when I'm trying to harvest! I will try to remember and send you a flare when I post about the "rock" that came out of our field and is now part of the landscaping! We have to scour the ground when we plant beans, but some of these puppies must have been on close terms with the dinosaurs! some of the glaciers must have tuckered themselves out right around where I live because we have some major boulders to deal with every year or so! I've been pitching a u-pick rock farm for the last year but no one is taking me seriously! I still think it would work if there was a decent-sized town nearby!